I love the angel earrings. They go well with a necklace that I own. I love the purple stone in each one of them. They are the perfect size. I am so happy with them. If there is ever a time when we need a shoulder to cry on, a confidant to share our feelings with or something to give us the strength to carry on, then it has to be when we lose a loved one. Sadly, this is one of the most trying moments in everyone's life, which is why we attempt to bridge this gap by creating our sentimental line of jewelry that includes the angel earring collection. Death is a gut-wrenching occurrence that not only takes away someone’s life but also takes away the peace and serenity of their loved ones, which often makes it impossible for them to move on. Unfortunately, only those who have been through this can comprehend how catastrophic death really is. We at Linda Stars understand how difficult this is for you and can – to some extent – relate to the pain that you are most likely going through. This is one of the many reasons as to why we have devoted ourselves to ease your pain and hopefully bring you a better and a more tranquil future with the help of our angel jewelry. Keeping a souvenir to remind you of your departed loved one is a tricky affair. For some reason, these kinds of gifts normally string along sad memories, which definitely drain and deprive you of the joy that life still has to offer. If not careful, gifts or souvenirs that are not well thought of will only delay the healing process. However, Linda Stars angel earrings are unique souvenirs that will enable you to keep the memory of your loved one alive and at the same time they will help brighten your mood. 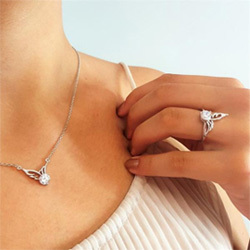 Although similar to ordinary jewelry, these pieces of angel jewelry are designed with a special meaning and for a special group of people.